A few weeks ago I had edited the closed question Is it “re-offend” or “reoffend”? in order to make it a better fit for being kept open. (*) My edit ended up in the peer-review queue. However I never saw my change accepted. So now I want to know why my edit was not accepted and subsequently why the question was not e-opened. (*) Because I think the question is very valid and the answers not just opinion-based - far from it: the answers show research with proper citations/links. 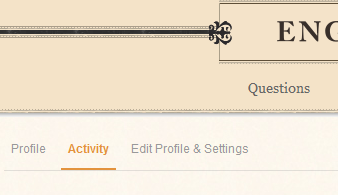 To find what happened to your suggested edits, go to the profile page on the site where you made the suggestion (Main ELU in this case: https://english.stackexchange.com/users/9579). The options available change with reputation level and privileges earned, but there should be enough here for you to navigate around the page. ...then All actions and Suggestions a little further down the page. 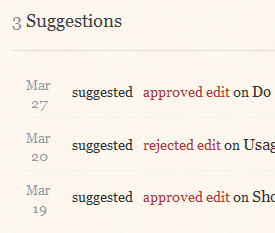 You can click on the words "approved edit" and "rejected edit" to see the result and how reviewers reacted to your suggestion. In the case of a rejected edit you should find the reason. I will answer the question, "Why was the question not reopened?" If you want to get a question reopened, you can edit the question body, which will automatically make it appear in the reopen votes queue if it is edited within 5 days of closure. For more information on reopen review queue, read How to get a question to reopen review queue? Since the question was closed longer than 5 days ago, you should post a Meta question to ask users to vote to reopen a closed question. Hyphens in verb construction containing prefix such as "re"
adding a prefix "re" to a word, with or without a hyphen? I am not sure why it was not closed as duplicate. I would have voted to close it as duplicate, but views of others might differ from my own.